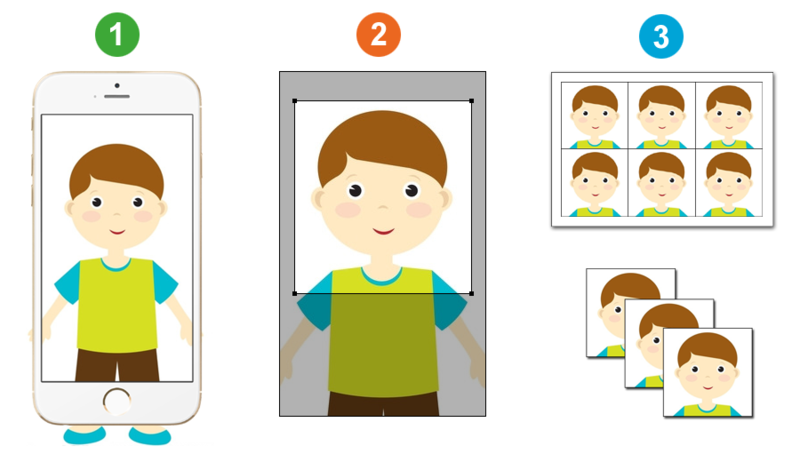 Step 1: Take passport photo using smart phone or digital camera. Take the photo in front of a plain background such as white wall or screen. Make sure that there are no other objects in the background. Make sure there are no shadows on your face or on the background. Position the camera in the same height as the head. 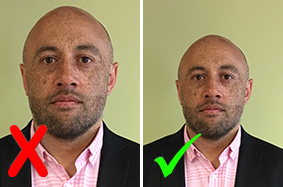 Shoulders should be visible, and there should be enough space around the head for cropping the photo. Step 2: Upload the photo to make passport size photo. 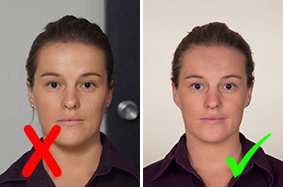 Click here if you want to make passport / visa photos for other countries. Scanned photos are not acceptable for our Online Passport Service. Stand slightly away from the background. Ensure that the light source is balanced, natural lighting is best. The image must be a true likeness and not be altered or distorted in any way. 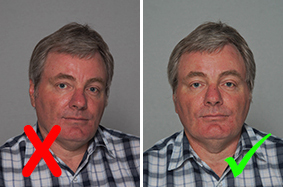 If the camera is too close to the face, the nose and forehead may appear larger and the ears less visible. Your head must be centred with a clear gap around the sides and top of the head. It helps if you can show part of the shoulders or the upper chest. Use a plain, light coloured background that is not white and does not contain objects or other people. Face front on to the camera. 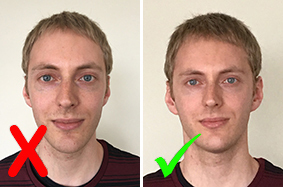 Hair should be off the eyes and sides of the face. You can wear glasses in your photo. They cannot be sunglasses, tinted or thick-framed. 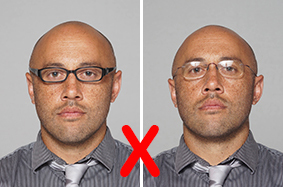 There can be no glare or flash reflection on the lenses. There must be a clear gap between your eyes and the frames. 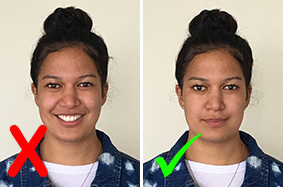 Have a neutral expression with the mouth closed. 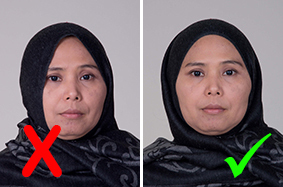 No head covering or headband should be worn in the photo, unless you must wear either for religious or medical reasons. In this case you will need an endorsement in your passport. No selfies as it can distort the face. We recommend you lay the baby flat on a plain coloured sheet, that has been firmly fixed to a base or the floor. The photo should be taken above the baby with them facing front on with their eyes open, face in full view and no objects or people in the background.